I keep hearing it called Hillary Duff’s new show, but really they should call ‘Yougner’, Sutton Foster’s new show, because it’s really all about her. It’s a scary world for a mother of a senior in high school and recently divorced, but Liza Miller (Sutton) is embracing her new freedom by returning to her 20s. It made sense that she wanted to go back to work after her husband left and her daughter is spending her senior year abroad, and not just because she had to. But a lot has changed since she was working. Twitter, Facebook, Tinder, just to name a few. And Liza doesn’t know what any of it means. Then one night out with her friend, Maggie (Debi Mazar), she gets hit on by a really cute and much younger guy, Josh (Nico Tortorella). She flirts and has a little bit of fun, but walks away, because he’s just way to young. Not before he puts a date in her calendar though. Maggie comes up with the great idea to make Liza 26, so she can get a job. It seems leaving work and raising a daughter doesn’t make it easy to just go back to work. But pretending to spend three years in India and write a book is much better. This devious plan works and she gets hired to be an assistant to Diana Trout (Miriam Shor). Apparently Diana likes to destroy younger women. This is where Hillary finally makes her appearance as Junior Editor Kelsey Peters. It appears that Liza will learn a lot from Kelsey. Thankfully for us girls, Liza decides to pursue something with Josh. He’ll be great eye candy, but the show is seriously funny even without the eye candy. Liza doesn’t know half of what people are saying. She’s so out of tune with pop culture and being quizzed on Katniss Everdeen, One Direction and Harry, isn’t going to make the new world of social media any easier. It’s a nice fantasy for anyone living in suburbia to be able to do it all again. Maggie is certainly loving living vicariously through Liza. Liza will have to be careful though, or her real life and her 26 year old life might overlap. 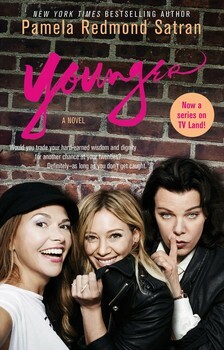 Make sure to tune into ‘Younger’ on TV Land, Tuesdays at 10/9c.